Where to Buy Wholesale Sign Supplies? Right Here! These Sign Supplies Work on Tabletops and on Floors, and Can Also Display On Walls For Maximum Versatility! Customize Your Advertisements! 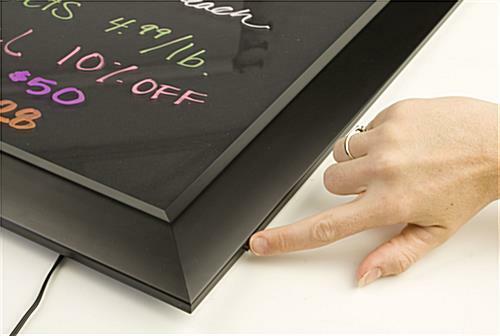 Black write-on board lets you change your message as needed! 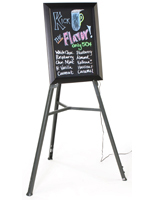 Floor-Standing easel brings 25" x 18-1/4" marker board up to eye-level! Illuminated marker board has 13 different lighting settings! Bright fluorescent colors attract attention! These menu boards, compact sign supplies that light up have red, green, and blue edge-lights. These edge lights are alongside one edge of the board, and highlight your written subject matters. Once the marker pen exhibit is plugged in and lit up, you can select from thirteen varying lighting patterns. 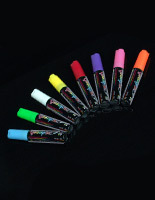 This illumination ensures your liquid chalk marker communication surely sticks out! 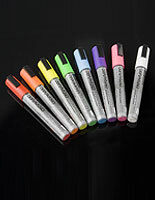 A wet-erase marker pen set provided with these sign supplies come with eight (8) different pen colors. Every chisel-tip, 3/16" fluorescent chalk pen will stand out against the black paneling. 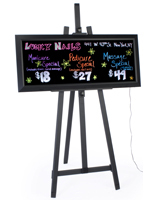 These sign supplies that illuminate also have wall-affixing and hanger kits, in case you'd like to utilize it without the easel at any point. 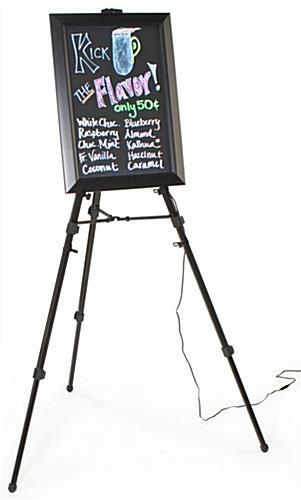 And, the easel itself can be utilized as a tabletop or floor-standing easel (only floor-standing position when configured with fluorescent signs). Also provided with the order of these reusable sign supplies with marker kit is a non-abrasive cleaning fabric. These premium sign supplies with mounting hardware are the ideal option for your company! No matter the goal audience, these displays get noticed. 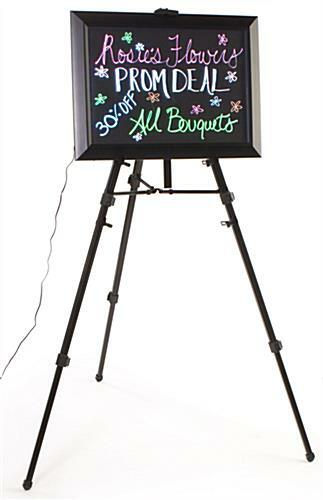 The sign supplies that flash lights come with a black edge-illuminated signage, an eight (8) marker pen kit, and an easel. These sign making sets have everything you'll require to produce your individualized, fluorescent pen subject matters daily! These sign supplies are the ideal option for a menu board in an eatery, but is also suitable for exhibiting signage at the entry way of almost any professional organization. From museums to nightclubs, these communication panels and easels will get your communication across immediately and clearly to clients or customers. The easel sports an adaptable topside clamp to anchor the sign supplies with illumination patterns safely in position. The easel is easy to put together and take apart for transportation. 40.0" x 75.0" x 36.0"